Comprehensive information about Gabriele D'Annunzio including biographical information, facts, literary works, and more. Gabriele D'Annunzio or d'Annunzio was an Italian poet, journalist, novelist, dramatist, and daredevil. His role in politics is controversial due to his influence on the Italian Fascist movement and his status as the alleged forerunner of Benito Mussolini.. Italian poet journalist novelist dramatist and soldier during World War I This educational Gabriele D'Annunzio resource has information about the author's life, works, quotations, articles and essays, and more. 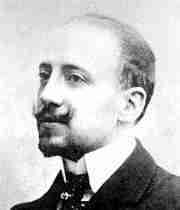 Articles about Gabriele D'Annunzio or articles that mention Gabriele D'Annunzio. Here are a few random quotes by Gabriele D'Annunzio. Limit to courage? There is no limit to courage.